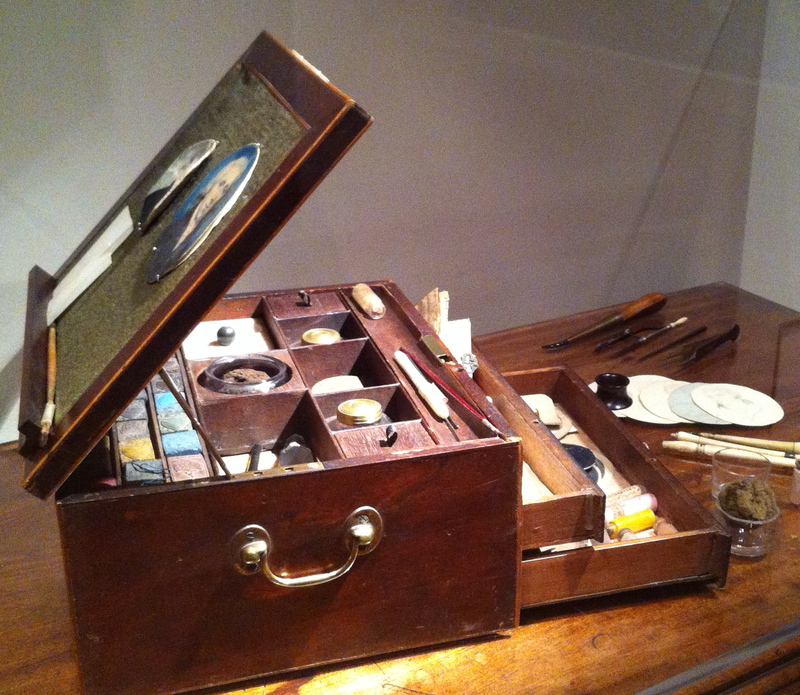 Miniature Portrait Painter’s Box. Probably United States ca. 1790s. Mahogany with brass fittings. 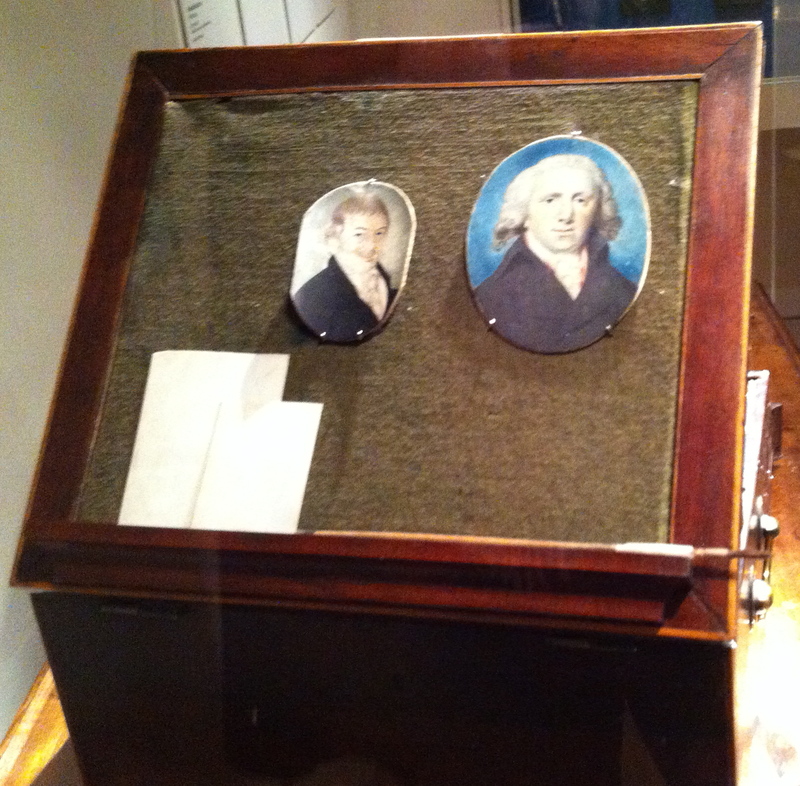 This late eighteenth century artist’s box is like a portable portrait studio. It’s believed to have belonged to an unknown American traveling artist and contains all the tools and materials they would need to paint portrait miniatures on ivory with either powdered color or watercolor. I came upon this treasure when I went to see the Metropolitan Museum of Art’s collection of portrait miniatures. It’s an area of the museum that isn’t very big, but I could spend a great deal of time there simply admiring the faces of the past. 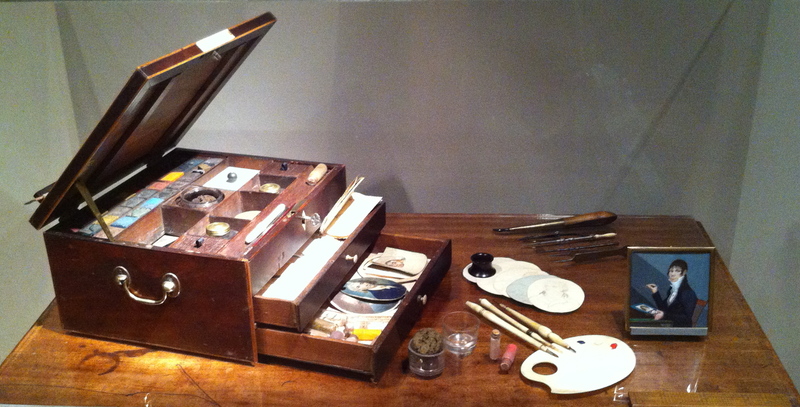 Inside this artist’s box are two palettes, one in ivory and one in porcelain. There are gums for binding pigments or glazing, and brushes that have quill ferrules and bone handles. Also housed within the drawers are slivers of ivory cut into ovals and squares, pieces of paper, a brush rest, sponges, chalk, and galipots for water. The box also contains drawing instruments for the artist to accurately measure the small panels; two pairs of compasses, a wood rule, styluses for tracing, and agate burnishers to seal the edges and backs. Some miniature portraits could be as small as 40mm x 30mm, so the artist also kept an eyepiece to magnify their work and help them create the intricate details. Since the portraits were so small, the artist was able to use the lid of the box as an easel, which could be raised to an angle with brass struts. The ivory would have been secured on the baize with common pins, and a container of them can be found in this box. And finally, several completed ivory portraits were kept within the box to showcase the miniaturist’s skill to prospective sitters. A similar box is depicted in the portrait above. 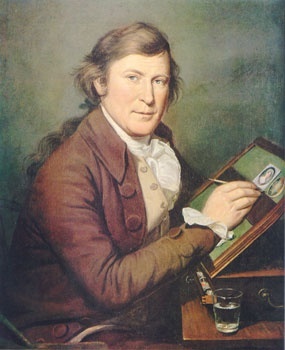 It is by the well-known American portrait painter Charles Wilson Peale (1741-1817) and shows his brother, the famous American miniaturist James Peale, at work (ca. 1785). Love this post! I am reposting to day on my blog . . . and will check out your other posts too. Thanks for the kind words. I’m glad you enjoyed reading it and thanks for sharing it. This is a lovely post! Enjoy! Thanks for all your “likes” and for stopping by. I’m glad you found the information interesting.